A long, long, long time ago, I bought my first pair of Ray-Ban "wooden" Wayfarer II sunglasses with the Polaroid lenses at a small clothing shop in Seattle off of Broadway in Capital Hill. And then I had them stolen. So I bought another pair. And then those got stolen. And then I bought my last pair before you could no longer buy them any more from anywhere. That was well over 20 years ago. I had my car valet parked somewhere in Los Angeles and when I came back, my entire Ciao! bag (yes, I said Ciao! bag and yes, I know that's so 1980s, but it was black and unique and nobody had one) was stolen with some stuff in it along with my "wooden" sunglasses. I put wooden in quotes because the Ray-Ban version was actually made of plastic and had a coarse feel to the surface, almost like they had been made of real wood but forgot to sandpaper them to a fine polish. Here's a picture of the Wayfarer I version, which is slightly bigger and rounder at the bottom of the frames. Personally, I like the squarer Wayfarer II style, which I can't seem to locate anywhere online. But I did find this vintage sunglasses site that has a rare pair of the Wayfarer I wood frames for sale at about 6 times the original price. Around the start of eBay, I started to create a search filter for these frames and only twice in about 5 years did I get a hit. The first one was for a pair of "Woodies." I wasn't familiar with this brand, but I ended up "stealing" them on a last-minute bid from another eBayer for about $65. The guy or girl must've been pissed. I would've been. A couple days later, a woman asked if she could buy them from me for double the price. I didn't respond. These frames were actually slightly larger than the Wayfarer I style, but they were made of real wood and kept in a beautiful wooden case. Oh, the woman who asked to buy them from me also said that the frames I bought weren't very good and would break easily. I didn't know why she would offer to buy them from me for double the price I paid if they were so bad. Those frames ended up getting stolen from my SUV after a homeless dude broke my window in downtown LA. I almost cried when I discovered they were gone. No, I did cry. I remember now. The second time my search filter went off on eBay, there were a set of frames that had a high bid of well over $300 and going higher. I maybe would've bid $180 for them, so $300 and up was out of the question. I just did a search and found these frames sold for $500. About 3 months ago, I did another search on eBay and found several vintage wooden frames up for auction, one of which I placed a bid on and won for $18 plus $7 shipping. They were in good condition, but just not something I would want to wear. 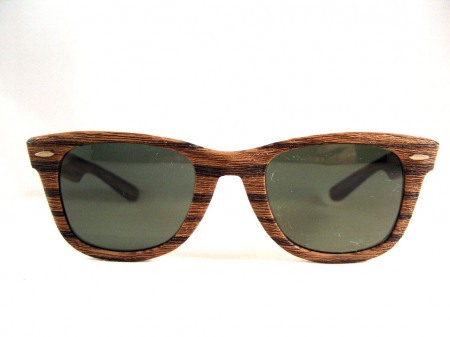 But then I did a general search online for wood sunglasses and got a couple new sites. 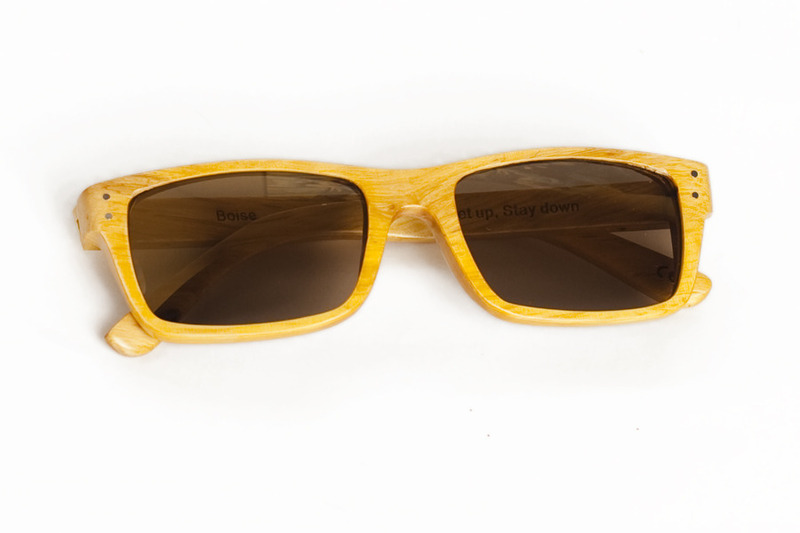 Proof sells real wooden frames and so does a company called Shwood. Plus, they're new! So you buy them for the retail price and no markup. I bought a pair of Proof Boise Zebrawood frames with Polaroid lenses for $125 and they were great until I put them in my pocket while doing some shopping and broke one of the hinges. As you can see, the frames are more square than the frames above, and they do look a lot more like the Wayfarer II style I like. The day before I broke my Proof sunglasses, I was walking down 3rd Street Promenade and a guy with a retail kiosk stopped me. He noticed my frames and wanted to see them. Turns out, his kiosk was for a company called Sire's Eyewear. He gave me his card, Wes Freitas was his name, and then he went to work studying my frames. He even asked if he could put them on. Impressed, he told me how they were cut and that they actually had wooden screws instead of metal ones. I actually hadn't noticed that before. Wes said his frames were really popular and his biggest selling point was how unique wooden frames were. He knew about Shwoods but never heard of Proof. It turns out, this wooden frame thing really isn't so unique anymore. Go figure. The frames Wes sold weren't all wood, he later noted. They had a plastic backing, but then he went on to show why it was necessary. He said all-wood frames tended to break too easily. I'm not accusing him of breaking my frames, but I think he was testing them to see how strong (or weak) they were. Lesson learned: Never ever give your wooden frames to a competitor's salesman to test how strong they are. They're $125 plus shipping. A guy can seriously go broke buying all these wood frames. I really gotta temper this obsession. I love wood sunglasses. I think they are really classy. Actually I love them so much I made my own pair a few years ago. I carved them from a two by four and a box cutter. I then started making them with a band saw and a dremel tool. It was quite a journey. Now I make them through a work shop. It has been a pretty sweet journey. 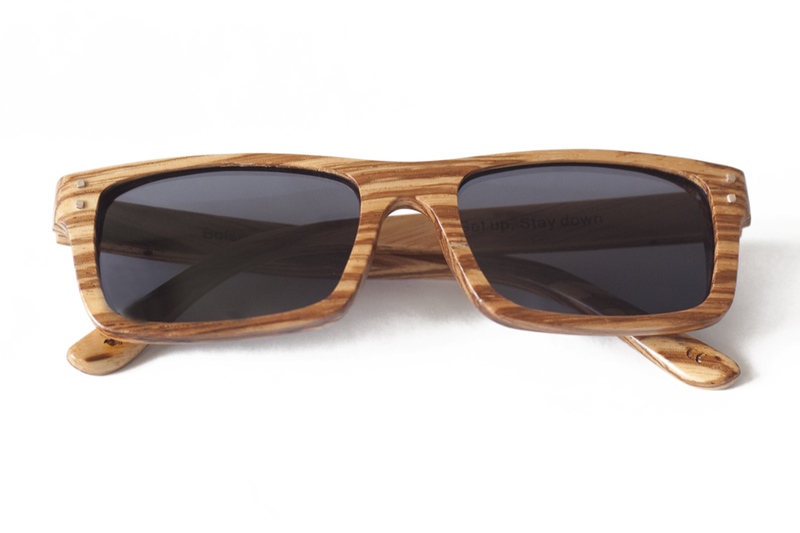 I love wood sunglasses. Thanks for your comment! I checked out your company site and I'm impressed by your story of how you started. If only I had taken my obsession to your level, I probably would have sawed off a finger or two as well. But then I'd probably have a lot more to talk about than all the wooden sunglasses I had lost or got stolen throughout my life. I plan to update this post sometime soon. It seems to be the most popular post on the site. I actually bought two more frames since this post and I'll make a mention of your company as well. OK, take care of those digits! These are very unique sunglasses. 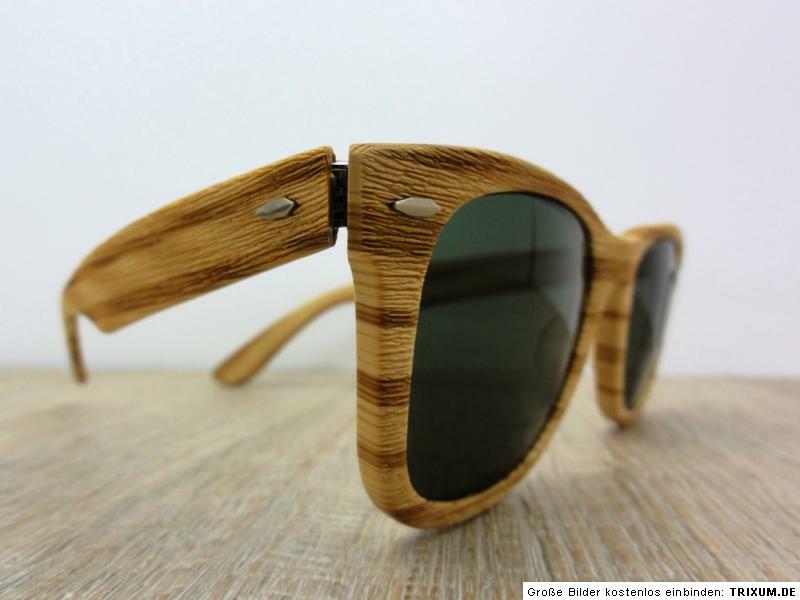 The wood is such a cool looking design for sunglasses. I wonder how comfortable these would be on.